A versatile, non-destructive moisture meter. TechScan combines ease of operation with innovative features. 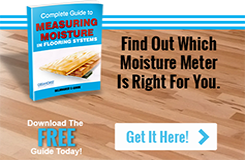 Ideal for moisture measurement in wooden frames, floors, rebated doors, and more. Eg. for monitoring and detection of leaks in motorhome, caravan or boat walls this moisture meter is suitable too. With advanced RF scanning technology, damp spots are detected quickly on large surfaces. The adjustable alarm signals each detected moisture concentration. For measurements beyond visual range, the function is used. The measurement result remains fixed in the display.